Fresh coriander leaves (also called cilantro) bear a strong resemblance to parsley. 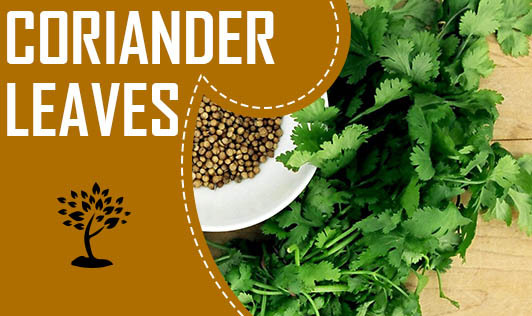 Coriander leaves are used extensively in the culinary traditions of Latin American, Indian, Thai and Chinese cuisine. It enhances the flavour of Chinese soups, Indian masalas, and Mexican salsas. The pungent leaves are used widely in curries, salads and sauces and can be easily grown in kitchen gardens. In herbal medicine, small fresh bunches are eaten as a tonic for the stomach and heart. The leaves are used for strengthening the urinary tract and for treating urinary tract infections. It is also believed to aid digestion and is useful in treating colic. Not only is coriander replete with a variety of phytonutrients, this exceptional herb is a good source of beta carotene, vitamin C, iron and dietary fibre. Since it is available all round the year, regular usage of this herb in cooking helps to meet the requirements of essential vitamins in an inexpensive way.